Raccoons are one of the most commonly dealt with nuisance animals. They have adapted to living with humans. They have learned that garbage cans and dumpsters are excellent sources of food, and that houses are excellent habitat. A mother raccoon will often tear a hole in a roof to access an attic, where they will make quite a mess and a lot of noise. Moles are very destructive to lawns and pastures. You can tell if you have moles by their trails and mounds of dirt in the yard. They can ruin a well manicured lawn. Squirrels love to live in attics. They also love to chew, and will chew on houses or wires, ducts, pipes once inside an attic. People don't like the noises of squirrels running about above the ceiling or in the eaves, but it's really the chewing that's a problem. If squirrels chew on electrical wires in an attic, it can create a real potential fire hazard. The problem with a ground hog is it's persistent digging. They can cause significant damage to gardens and flower beds. Beavers cause a lot of damage to trees around ponds and creeks. Along smaller water ways they dam up creeks and dredge ditches, which causes tiles to plug up and low land flooding. Most beaver trapping methods are lethal, although there are some live traps available. Bats can get through the smallest of openings in a house and take up residence in the attic. Sometimes they will find their way into living quarters. They are a health hazard from their guano. 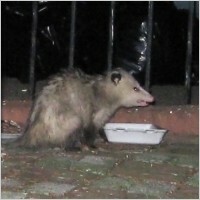 Opossums are often times found under porches or sheds. They will also find their way into an attic where they make there way into the walls. They loot the garbage and steal pet food left out. You will know if you have a skunk living on your property. Besides the smell, skunks are also well known for grubbing in your lawn which can cause a lot of damage in a night. Servicing Ames Iowa, Nevada Iowa, Boone Iowa, Jewell Iowa and many other surrounding communities.